4101 Ibis Point Circle Boca Raton, Fl 33431 has been sold. You can view available homes in Sanctuary. GIVING GLORIOUS PRIVACY AND VIEWS ON 208+/- FEET OF WATERFRONT WITH YACHT DOCKAGE, THIS ONE-OF-A-KIND PALM BEACH-STYLE ESTATE STRETCHES ACROSS TWO DEEPWATER PROPERTIES, SET BEHIND HIGH HEDGES AND LANDSCAPED WITH LUSH SPECIMEN TREES. AS THE CENTERPIECE OF THE RESORT-STYLE OUTDOOR ENTERTAINMENT AREA, THE FORMAL POOL IS SURROUNDED BY A COQUINA STONE PATIO AMONG COLONNADED LOGGIAS AND SWAYING PALM TREES. HOSTING A FULL CABANA BATH PLUS AN EXERCISE ROOM/BEDROOM, THE POOLSIDE GUEST HOUSE OPENS TO ANOTHER OUTDOOR LIVING SPACE FEATURING A FIREPLACE PLUS AN ADJACENT FULL KITCHEN AND STORAGE ROOM. 4101 Ibis Point Circle located in Boca Raton, FL is a single family home with 6 bedrooms, 8 full baths and 3 half baths.The Home at 4101 Ibis Point Circle was built in 1998 in Sanctuary and offers a 3 car garage. This Sanctuary Home offers tennis. 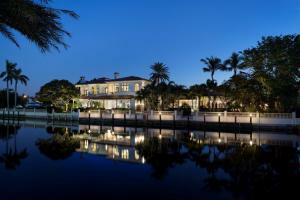 4101 Ibis Point Circle Boca Raton, Fl is currently listed for $8,950,000 under the MLS# RX-10393219. This Home has been put on the Boca Raton MLS system and currently has a status of SLD. Sanctuary in Boca Raton is really a wonderful community in a great city. If you like the beautiful Boca Raton location but you are not sure about this community. You might like one of the other local communities like Royal Poinciana or Winfield Park or Golden Harbour or Weitzer or Wedgewood Estates that are located here.